As we all know, golf often takes it on the chin for having an image as being too elitist, a stereotype that isn’t always wrong in this country. But I sit here slack-jawed, having just read one of the most unfounded, absurd, dare I say idiotic, attacks on the game I’ve ever seen. It comes from a very unlikely source: Randy Cohen, the ethics columnist for the New York Times. Now that the International Olympic Committee has given golf a tentative thumbs-up for the 2016 summer games, Cohen evidently felt compelled to question the wisdom of their decision in a column headlined, "Is Golf Unethical?" You’ve got to figure the column isn’t going to play out well for golf when, early on, Cohen cites that authority on all things ethical, Venezuelan president Hugo Chavez, who recently dismissed golf as a "bourgeois sport." Weighing the IOC’s favorable take on the game against Chavez’ – "golf’s underlying ethos," Cohen calls it – he concludes that "on balance Chavez has the stronger case." Cohen goes on to concede that the golf community isn’t "monolithic nor immutable," but he does note that the "current customs and values of big-time professional golfers" who are most likely to play in the Olympics "seem remote from the Olympic ideal." And don’t think Cohen is taking a swipe at only the millionaire Americans on the PGA Tour. He finds the "international perspective" on millionaire golf pros in a piece in The Irish Times, by Bruce Selcraig, during the 2006 Ryder Cup: "They drive the same luxury cars, have the similar messy divorces, and whether they be from Denmark or Denver offer up the same golf cliches in a globalized TV-read English that pleases their corporate sponsors." Not to quibble, but Selcraig writes from an international perspective only if you consider Austin, Tex., where he lives, not to be part of the US of A. Then, in what Cohen clearly considers a kill shot from point-blank range, he reveals what he really doesn’t like about golf: PGA Tour golfers are too conservative. Still citing that internationalist Selcraig, who found a Sports Illustrated poll of 76 PGA Tour pros, Cohen notes that the poll found that 91 of the pros favored the confirmation of Justice Samuel A. Alito Jr. to the Supreme Court; 88 percent supported the invasion of Iraq; and 0 percent had seen "Brokeback Mountain." Haven’t seen "Brokeback Mountain?" The nerve of not going! Of course, you know what’s coming next. That’s right, Cohen goes right to the issue of Augusta National, home of the Masters, not having a female member. It also does not escape his attention that in 2002, during the Martha Burk-inspired protests over the club’s membership policies, that a certain Tiger Woods was "conspicuously willing to play at a sexually segregated club" and that his "complacency" was "especially sad." Unsatisfied to simply cast golf as an elitist game that Chavez believes is not a "people’s sport," Cohen goes on the assert that golf courses are essentially a blight on the planet. After all, they require pesticides and gulp too much valuable water, making the game not in keeping with the Olympic Movement’s declared intent to "encourage and support responsible concern for environmental issues, to promote sustainable development in sport." Where to begin refuting this load of crap? I know; I’ll begin by saying I’m a registered Democrat, yet this is the kind of drivel that makes me want to smack an Upper West Side wimpy liberal and spend the rest of the day watching Fox News. To dismiss an entire game as unethical -- of course, golf has no ethics per se, no political bent -- because the .0001 percent of golfers who make it to the PGA Tour are generally conservative is total hogwash. What made this column really stick in my craw is that I happened to read it on the very day that a friend’s 14-year-old son, who was trying out for his high school golf team, called me for advice. It seemed he faced a situation that tested – you got it -- his sense of ethics. During the round earlier that day, he had been paired with another kid who was also trying out, just the two of them. The coach had instructed them to keep each other’s scorecards, like they do on the PGA Tour. His dilemma was this: He didn’t think the other kid was counting all his strokes, whether deliberately or not. A relative newcomer to golf, my young friend wrote down the scores the other kid told him, and even signed the scorecard after the round. But not long afterward, it began to eat at him. By then, the other kid had left, so it was too late to confront him. My young friend’s question to me was this: Should he say anything to the coach or should he just keep his mouth shut? My advice: Pull the coach aside and tell him what happened. The coach handled it well. He thanked my young friend for having the courage to step forward, even if it was a little later than was ideal. At that point all he could do was say he’d keep an eye at the other kid the following day, when he’d be back for the second half of the tryout. That, Randy Cohen, in a nutshell, exemplifies the ethics of golf. Come to think of it, name me any other sport where the most elite players, regardless of their political leanings, routinely call penalties on themselves for infractions that nobody else would have ever known about. If fact, in golf, if you want to cast a shadow over your integrity that will follow you for the rest of your career, simply give your peers reason to believe you breeched the game’s strict code of self-policing – in other words, its code of ethics. Hey, just ask Vijay Singh. While Cohen faults Augusta National for its lack of female members, which I also find regrettable, it is after all a private club and free to establish its own membership policies. Anyway, does Augusta National’s lack of a female member undo the good the club does by donating much of the proceeds from the Masters to local charities? That figure was $3.4 million this year and $39 million over the past 12 years. Oh, and let’s not forget that with the glaring exception of the Masters, neither the PGA Tour, the PGA of America nor the U.S. Golf Association will allow any of their tournaments to be held at clubs with similarly restrictive membership policies. Actually, there is even some talk that Augusta National might finally be ready to reverse it own policy, in the person of no less than former Secretary of State Condoleezza Rice. As for golf courses generally being a detriment to the planet, hogging water, perhaps Randy Cohen missed a recent story that occupied a substantial chuck of the front page of his own paper, the New York Times. The headline was "On the Fairway, New Lessons in Saving Water." Datelined Atlanta, it was a lengthy and detailed report on how increasingly government officials and corporations are turning to golf course superintendents for their expertise in how to reduce water and chemical usage. Apparently, necessity being the mother of invention, golf is leading the way these days. As for PGA Tour players being too conservative for Randy Cohen’s tastes, even I have to admit that they do come by it somewhat honestly. Golf, after all, is not a sport where players sign multi-million dollar, multi-year, no-cut contracts with teams. 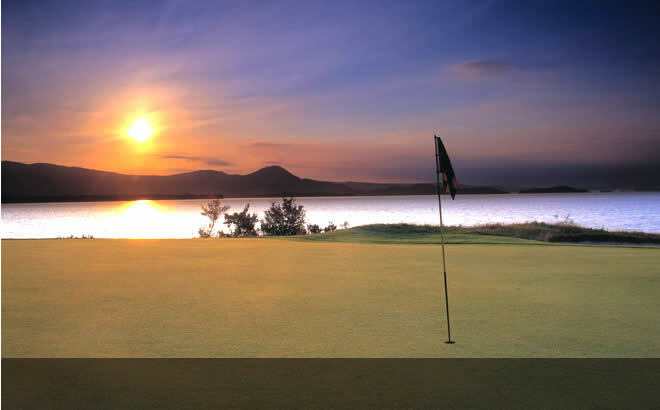 In golf, there are no guaranteed contracts. Pro golfers are lone wolves who eat only what they kill. To Chavez’s point that golf is not a sport of the people, give me a break. Like what, those other sports of the people in the summer games such as sailing, fencing and equestrian. And did either of them bother to look beyond the gilded clubs like Augusta National to a local muni, like Cobbs Creek in West Philadelphia or FDR in South Philly, never mind much of England and most of Scotland, where the game is quite egalitarian. Don’t blame a game for what some people have done to it. "Is Golf Ethical?" Don’t make me laugh. Hello, Michelle Wie; so long, Juli Inkster. While the big news out of the Solheim Cup was a third straight victory for the Americans, two other compelling story lines were definitely grabbing headlines. At 49, Inkster was playing in her eighth and final Solheim Cup at Rich Harvest Farms outside Chicago. As she eclipsed Meg Mallon over the weekend to become the U.S. team’s all-time points leader, Inkster vowed that this outing brought down the curtain on her long and storied Solheim Cup career. "I’m not doing a Brett Favre," vowed Inkster. Meanwhile, the U.S.’s 16-12 win over the Europeans also marked the impressive arrival, more or less, of rookie Michelle Wie as a future star on the LPGA Tour and a future staple on the U.S. Solheim Cup team. Wie, the former wunderkind, was a captain’s pick by Beth Daniel, along with Inkster. She responded by going 3-0-1 – the best record among Americans – highlighted by her victory on Sunday in singles over European veteran Helen Alfredsson. It was the kind of performance golf fans have been waiting to see from Wie, whose career has already been so up-and-down it’s easy to forget she is still only 19 years old. Inkster, among others, believes it was just the kind of confidence-booster the young Hawaiian needs to rejuvenate her career. "I would bet you a large amount of money that Michelle will before the year is out, said Inkster. For anyone who has followed Wie’s see-saw career, it was also good to see her smiling once again. This is good for golf. Maybe it doesn’t seem like it right now. Maybe our image of Tiger Woods as invincible and super human is shattered for the moment, but this is good for golf. Who among us didn’t watch in utter disbelief -- jaws on the floor-- as some guy we’d never head of named Y.E. Yang faced down the mighty Tiger? Who among us hadn’t figured that Tiger’s 15th major championship was already in the bag, in the record books, a foregone conclusion? Tiger blow a two-shot lead in the final round? Yeah, right. No way? Fat chance. Not gonna happen. It’s tempting to say that Tiger didn’t blow the PGA, that Y.E. Yang came and got it. But the fact is, Yang shot 70 in the final round, not 63 or 64, and Tiger shot 75. That’s blowing it. We just can’t believe it was Tiger who did the blowing. If you watched the post-game press conferences, Tiger was in a place I’ve never seen him before. He looked stunned, beaten, humbled, like a hit-and-run victim who hadn’t quite gotten the license plate of the car that just hit him. He had no excuses because, well, he had no excuses. For once, the opposition refused to fold in the face of his intimidation and he flat-out got out-played. Tiger said he hit the ball great on Sunday, and it looked like he did. But he missed a half-dozen putts that he usually makes. Come to think of it, for all the awesome length and majesty of Tiger’s tee shots, never lose sight of the fact that it is his short game – specifically his putter – that has always separated him from the rest of the golfing pack. We are left to wonder what this means? Is Tiger now broken, or brought down a notch? Or is it a freakish occurrence, a minor mishap? Remember, even if he didn’t win a major this year, he has still won four times so far, including state-of-the-art, back-to-back wins at the Buick and the WGC-Bridgestone just before this. I started by saying I think this is good for golf. I do, because I think this makes Tiger seem human, not some mythic figure. Everybody saw this, everybody. The next time Tiger strides onto the practice tee at a tournament, with that air he has of a man who cannot be beat, who owns golf, every single guy on the range will look up and notice. They won’t say a word, they wouldn’t dare, but they will think, "It turns out you can be beat, Tiger Woods. Next time, maybe it’ll be me." It gives them hope, a reason to work harder. Imagine what Phil Mickelson must be thinking tonight. Best of all, this will spur Tiger on to even greater things. Words cannot describe how he hates to lose. The man who we thought couldn’t work any harder will work harder. He is determined to eclipse Jack Nicklaus’ record of 18 majors. He will, eventually. On Sunday at the PGA, he was denied in humiliating fashion. In the long run, he will not be. Is it just me or does the idea of a full-throated debate about whether golf should be included in the 2016 Olympics also make you want to curl up and take nap. I mean, really. I love golf. Played it since I was 8 or 9. I make my living writing about it. I watch way too much golf on TV. Still, for some reason, I couldn’t care less whether golf becomes an Olympic sport. Chances are, it’s going to happen. On Thursday, the International Olympic brass picked golf and rugby from among a half dozen or so sports (baseball, softball, squash, karate, roller sports) for proposed inclusion in 2016. I am fully aware of the arguments in favor of adding golf to the Olympics – namely, that it will give the game worldwide exposure, immediately igniting golf crazes in such potentially robust markets as Russia, China and India. No question, given the current economy and the sluggish growth of the game here in America, equipment manufacturers and out-of-work golf course architects would love it. The PGA Tour also supports golf’s Olympic push, along with the U.S. Golf Association and the Royal & Ancient, the governing bodies of golf, whose missions include growing the game. Even Tiger Woods, the only golfer who really matters, said this week at the PGA Championship that he would play in 2016, if he’s not retired by then. He said that last part with a smile. I also know the arguments of the naysayers, that golf already has four major championships that are increasingly full of international players, not to mention the Ryder Cup, the Presidents Cup and the World Cup. My only reason for shrugging is, well, what has happened with basketball. I am old enough to remember when the United States, long the king pin of basketball, got beat by the Soviet Union in the 1988 Olympics, largely because of a cheap, bogus call but a ref. Of course, that’s when it was our college players against the essentially professional national teams from around the world. 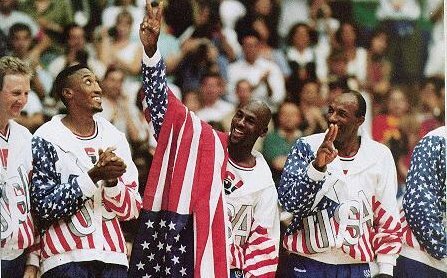 Our response was the original Dream Team in ’92, an array of NBA stars – Michael Jordan, Larry Bird, Magic Johnson, Charles Barkley, David Robinson, Scottie Pippen – that mowed down the international competition. Boy, did we show them. Okay, but here’s the thing. That first U.S. win in ’92 was sweet. Revenge is always sweet. But somewhere along the line, I stopped keeping track of Dream Teams. We made our point. Now, Olympics basketball is like a bad NBA All-Star. Do you care? No. Do you watch? Probably not. My fear is that golf in Olympics would be cool in 2016. Then it would go the Dream Team route. By 2020, when Tiger really is retired, the Olympics would be a burden that Tour pros who reluctantly try to squeeze it into their schedules. Another week they’d play for free. They’d say they were playing out of national pride, but deep down, it would be because they didn’t want to be ripped in the media for not wanting to play for the US of A.
I Ôd prefer that didn’t happen. And so, when the subject of golf in the Olympics comes up, my reaction is to yawn. Sorry, I’m just being honest. If Tiger Woods’ image is at a rock bottom, you wouldn’t know it from the reception he is getting at the AT&T National at Aronimink GC. Not only did Tiger have the largest following during Wednesday’s pro-am, around the golf course he was greeted with applause and pre-scandal respect and awe. No catcalls, no hoots or hollers, no thumbs-down, no embarrassing banners being towed overhead behind airplanes. It almost feels like Tiger is still the host of the tournament, despite the fact that he was famously dumped by communications giant AT&T at the wake of his personal life meltdown and his name was scrubbed from the tournament. On Tuesday, Tiger was ushered into the media center for his pre-tournament press conference, which felt no less official than when did them as the host of the three previous AT&T Nationals at Congressional CC in Bethesda, Md. And late yesterday morning, Tiger was seated front and center at the tournament’s opening ceremonies on the back lawn behind Aronimink GC’s ornate clubhouse. He was right there with PGA Tour commissioner Tim Finchem and rocker Jon Bon Jovi. Of course, whether Tiger is hosting or defending doesn’t seem to much matter to golf fans. All they seem to care about is that they’re finally getting to see the No. 1 golfer in the flesh. For reasons that never made much sense to me, golf, which often gets lumped in with polo and yachting as a frivolous pursuit of the rich, took a major public relations hit during the nation’s financial meltdown a few months ago. Remember the outcry over Northern Trust, which took bailout money, having the audacity to sponsor the Northern Trust Open in Los Angeles? And don’t forget the fallout when AIG was discovered to be entertaining clients at a golf resort. Suddenly, from coast to coast, companies and corporations that had long used golf to lubricate the gears of commerce were distancing themselves from the game, for fear of being portrayed as fat, rich and wasteful. At the U.S. Open at Bethpage, many corporations tried to get out of their contracts for hospitality tents. Of those who stuck it out, many opted not to display their corporate logo. And nothing sums of the state of things any better than the recent departure from the game of Buick, once the sponsor of four PGA Tour tournaments, not to mention Tiger Woods. So it was a pleasure, and a surprise, to pick up yesterday’s New York Times and see a positive story about golf, accompanied by photo, occupying a large chunk of page 1-A. The headline was "Thirsty Golf Courses as Model for Water Thrift," and it was a much-deserved nod to the expertise of the modern day golf course superintendent. 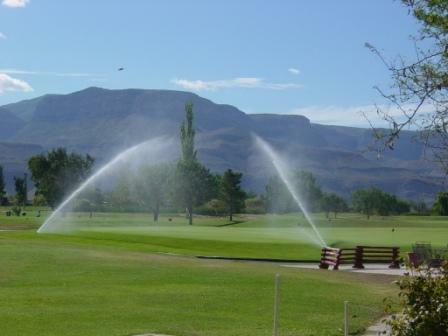 In a nutshell, the story said that in areas such as the arid Southwest and drought-ridden Southeast, nobody has figured out how to stretch a gallon of water more efficiently than your average golf course super. "In Georgia, golf course managers have emerged as go-to gurus on water conservation for both industries and nonprofit groups," said the Times story, which carried an Atlanta dateline. The story recounted the horrific drought in the Southeast of a couple of years ago, and described some of the creative measures golf courses adopted in their misery use of water. They mowed less frequently and more selectively, found grasses and plants that needed less water to survive and, of course, reduced irrigation, to name a few examples. Kathy Nguyen, president of the Georgia Water Wise Council, told the newspaper that her group had relied heavily on golf course superintendents in drafting guidelines for homeowners and industries. Finally, golf gets some positive pub.